Niger has accused West Africa's trade bloc Ecowas of misunderstanding the situation in the country a day after the group suspended Niger's membership. A government spokesman told the BBC that President Mamadou Tandja, widely criticised for tightening his grip on power, was a man of peace and dialogue. Moctar Mahamane Kassoum said he hoped to resolve the problems through talks. Niger was suspended after Mr Tandja pressed ahead with a parliamentary vote which was boycotted by the opposition. The election came after months of political turmoil sparked by Mr Tandja's attempts to stay in power for a third term. He dissolved parliament and the constitutional court earlier this year when they refused to allow him to change the constitution. The Economic Community of West African Stateshad warned the 71-year-old president to delay the election or face "full sanctions". Mr Kassoum told the BBC's Network Africa that the government had received no official word from Ecowas. "If it is true that Ecowas has taken such a decision it means that Ecowas is really wrong about Niger's case," he said. "This is a misunderstanding by Ecowas and I think we can overcome the situation through dialogue." But on Tuesday Ecowas political director, Abdel Fatau Musa, said it was clear Mr Tandja had rejected the decision of Ecowas. He defended the decision to suspend the nation, saying it would affect Mr Tandja. "If you are considered a pariah, an outcast, from an organisation you have ratified the conditions of, then psychologically it will affect you," he said. 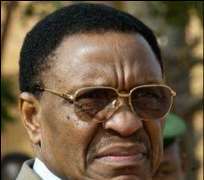 He warned that the issue could end up in the UN Security Council, and Niger could be left in international isolation unless Mr Tandja backed down. The president's move to stay in power in the uranium-rich nation sparked international outrage and dismay among opposition groups. He had been due to stand down in December after serving two five-year terms. In January, French company Areva signed a deal to develop what it said would become the world's second biggest uranium mine. The mine is in the semi-desert north, where ethnic Tuareg rebels have been fighting for more autonomy. President Tandja has signed a peace deal with several Tuareg groups.